The best Blueberry Mojitos to ever exist in the history of ever for like, ever – Move Over Martha, I'm Here! So I dabble in a bit of bartending, it’s how I paid my way though about 7 years of life and college! I thoroughly enjoy bartending and find true enjoyment in serving others, well, for the most part. I don’t work full or part-time in a restaurant, but occasionally, I get the privilege of being hired to bartend a private party. Typically it’s for my most favorite client, Niti. That’s her and I below with my friend Kevin, who worked a party with me! I met Niti through a neighbor of hers when I was working another private party. Niti loves having parties, has incredible taste, is an INCREDIBLE chef, and loves to have themes for her parties. These themes also extend to drinks – lucky for me! So in early June Niti’s son, Aayush, graduated from High School, getting ready to start and University of Pennsylvania in the Fall! CONGRATS AAYUSH!! 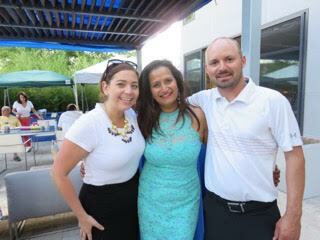 Anywho, so the “theme” for the party was easy – blue, gold, and red – Wissahickon and UPenn’s colors! My mission, should I choose to accept, was to create a red drink and a blue drink, one alcoholic and one non-alcoholic. In the summer, I LOVE cocktails. Refreshing mints, limes, cucumbers, gin, vodka. Great, it’s only 11:30 am and I’m already thirsty for a drink… Back to my story. So we made a version of a “hippie punch” for my friend’s bridal shower (and yes, I MUST get to that post because the decor was INCREDIBLE and it was legit the best shower ever!!!) which was cranberry juice, frozen lemonade, sprite, and vodka. We called it a “Blushing Bride” for the shower, and I thought this would make for (minus the vodka of course) a great drink for the high schoolers, and they loved that it was called “Hippie Punch.” We used Simply Mixed Berry, Frozen Pink Lemonade, and Gingerale with floating frozen cranberries. Its in the beverage container on the left in the photo below. We also did water with orange slices. It turned out so well, that we ran out of everything to make it and I had to keep stealing from Niti’s fridge. This is NEVER a bad sign!! Recipe is at bottom for those interested in the drink, just add a bottle of vodka and TA DA!!! Play with flavors and juices, but it’s an easy drink for crowds. So now the Mojitos. There’s nothing exceptionally different from this mojito except the Simple Syrup. That’s my trick which gave these mojitos it’s incredible color… Like, can you even!?!?!!?! I’ll post the mojito recipe below, but let’s start with the simple syrup. Now I’ll give you for one pitcher – double, or quadruple as I had to do (and we still ran out!!) and play with the recipe. Now, I mashed the blueberries into the bottom of the pot before anything, not a ton, just so most of the skins were broken. You can add mint to the simple syrup, well just about any herb to be honest – basil, rosemary, to give the syrup more flavor. I just needed the purple color this time. Boil until sugar is all dissolved. Literally, that’s it. Now this syrup should cool before mixing. You can pre-make a pitcher of mojitos, but I recommend just adding the rum (MUST BE CLEAR) and lime juice only to this simple syrup mixture, with ripped mint leaves (one rip, may two if large is enough, NO STEMS). I added a few lime slices and blueberries for viewing pleasure, but added mint, blueberries, and a lime to each glass. Ice melts diluting the alcohol and the mixture, and the club soda will go flat. So yes, I minted, limed, blueberried, iced, and club soda’d over 100 blueberry mojitos in the span of a few hours. So, with that said, the hippie punch and blueberry mojitos recipes are below. They’re for about a pitcher or two of drinks. Hope you enjoy as much as I do! First, I made the simple syrup. Mash about 20 blueberries into the bottom of the pot, just so most of the skins were broken. Boil until sugar is all dissolved and you’re happy with the shade of blue/purple. Rip mint leaves in half, add a few lime slices to the pitcher. Use a muddler (or the end of a wooden spoon) to muddle the mint and limes. Add the lime juice (about 2 cups) and the simple syrup. Add about half of the bottle of rum (apprx. 2 cups) – be sure to taste, as maybe you like strong, a little weaker, etc. You can always add an extra shot of rum to a glass if they need more. DON’T FORGET, we’ll be adding club soda to the mixture one in a glass over ice. I added some blueberries to the pitcher to make it look nice, but you’ll also have them from the simple syrup. 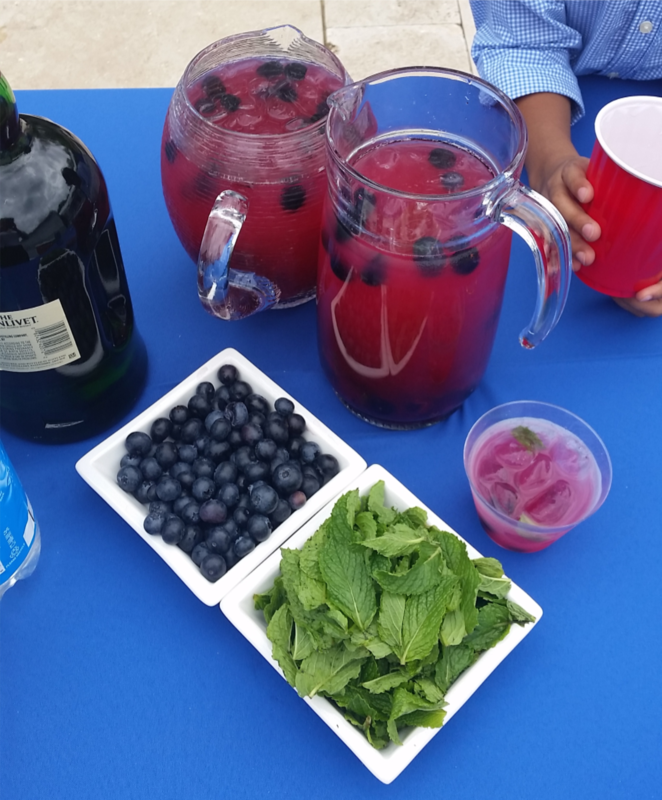 Pour ice and club soda into a tall glass, add a few blue berries and one ripped mint leave. Pour in the simple syrup, lime juice, and rum mixture. Gently stir. Garnish with a lime wedge if you like. Stir. Add vodka if desired.